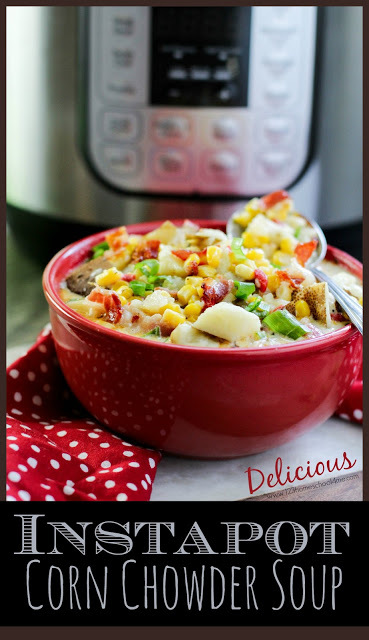 Everyone is going to love this quick and easy, Instapot Corn Chowder Recipe! 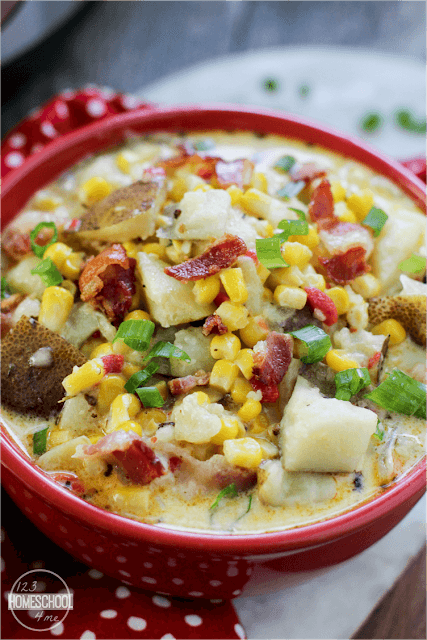 It is hearty, super yummy, and so creamy! 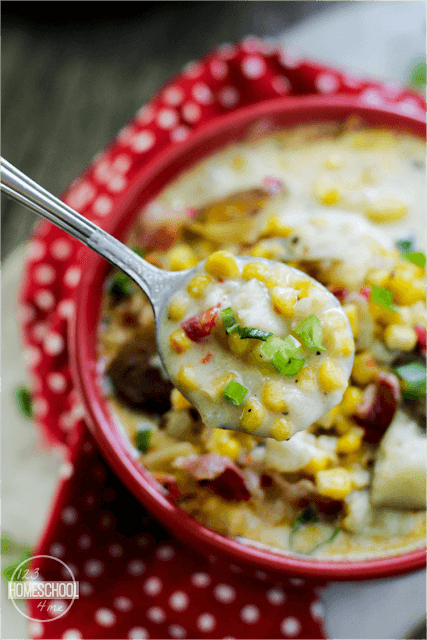 Here is your new favorite soup – Instapot Corn Chowder Recipe! It is quick and easy to make, a hearty fall recipe, and super, duper YUMMY! Set your Instapot to high saute; add in cut up raw bacon and cook until brown and crispy, about 5 minutes. 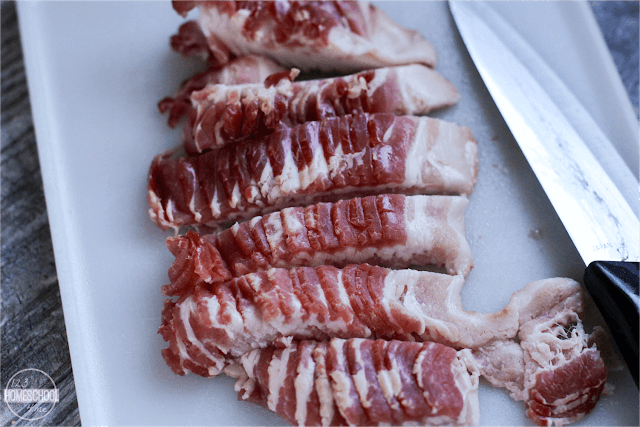 Pull out the bacon and put it on a paper towel-lined plate. Add chopped garlic and onion to bacon grease and saute until translucent, about 2-3 minutes. 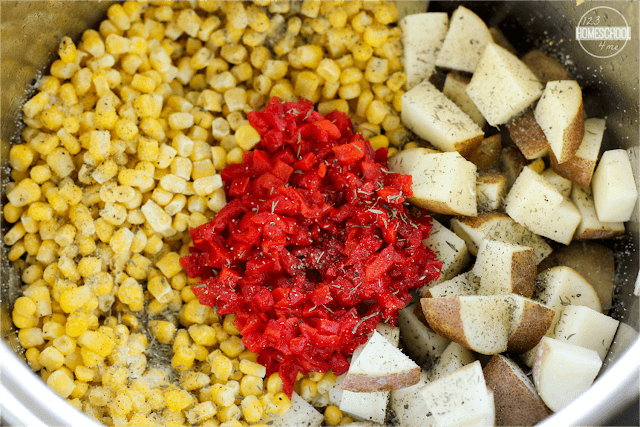 Stir in cut potatoes, corn, pimiento, stock, thyme, salt, and pepper. Select manual setting and set for 10 minutes. When it finishes cooking, use quick-release (see owners manual for instructions). Once it’s de-pressurized select high saute and sprinkle ingredients with flour and stir for 1 minute. Next pour in heavy cream and stir frequently until slightly thickened, about 4-5 minutes. Stir in cheese and serve immediately garnished with bacon and chives. 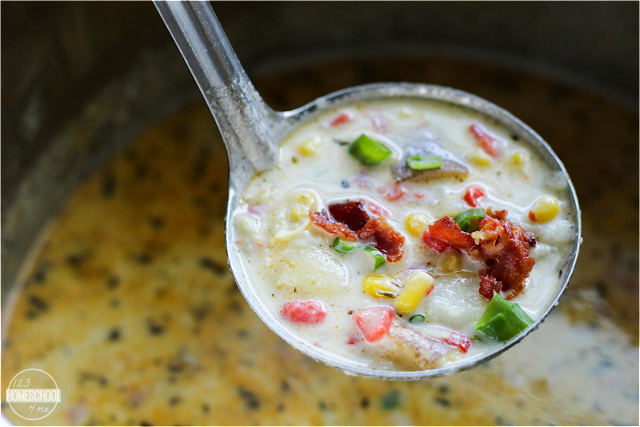 This soup is so flavorful and hits the spot on a cold evening! Our family likes an extra thick soup. But if you want to stretch your soup a little farther, you can easily double the water, cream, flour, and cheese for a creamy, less thick soup. 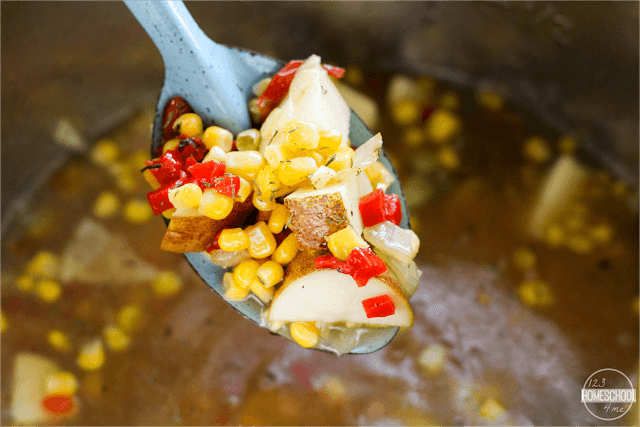 This is such a yummy, homemade soup recipe that is sure to become your families new favorite soup recipe. Set instapot to high saute. Add cut up raw bacon and cook until brown and crispy, about 5 minutes. Pull out bacon only and put on a paper towel-lined plate. Add garlic and onion to instapot with bacon grease in it. Cook, stirring frequently, until onions have become translucent, about 2-3 minutes. 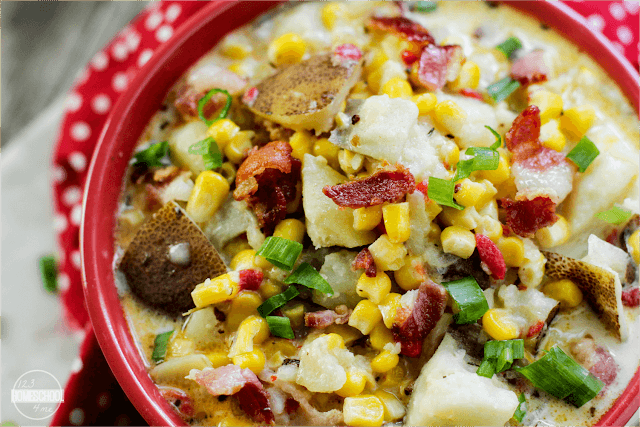 Stir in potatoes, corn, pimiento, vegetable stock, thyme and salt and pepper, to taste. Select manual setting; adjust pressure to high, and set time for 10 minutes. When finished cooking, quick-release pressure according to manufacturer’s directions. Select high sauté setting and sprinkle in flour and stir for 1 minute. Pour in heavy cream and stir frequently until slightly thickened, about 4-5 minutes. Stir in cheese and serve immediately, garnished with bacon and chives, if desired.